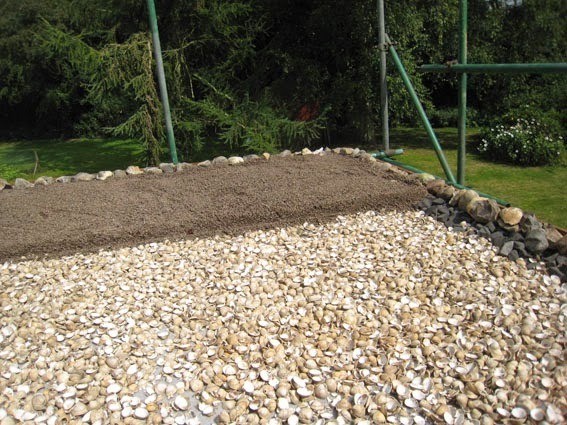 Below we have a blog post from a customer who used Cockle Shells supplied by Mainland Aggregates Ltd as a drainage layer for a Green Roof project. The roof has been taking longer than expected. 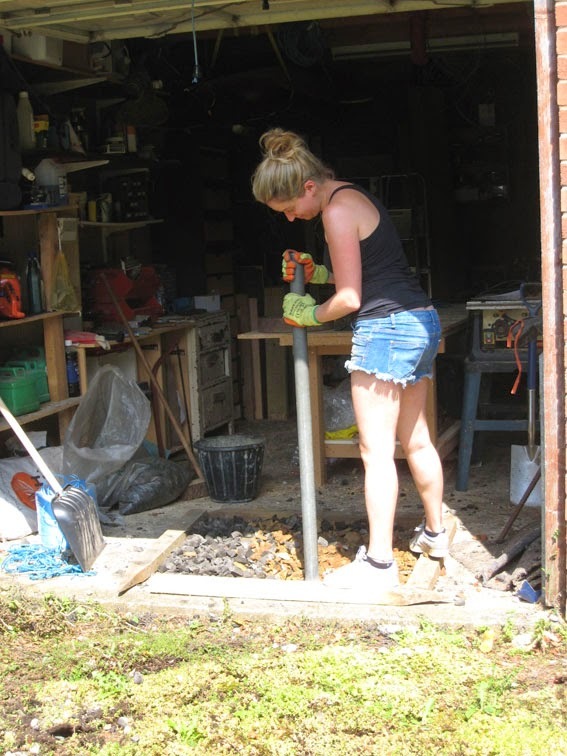 I was hoping to finish around the 20th July - so running about three weeks behind schedule. 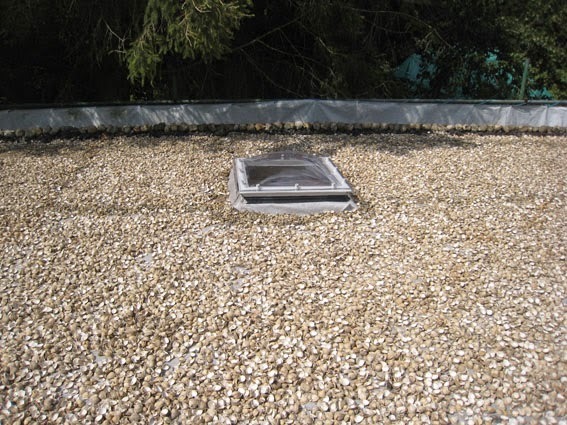 Adding the skylight was a late addition to the plan, and other aspects have taken more time because of the size of the roof. At around 55 square metres, it is a giant; you could have a game of tennis up there. 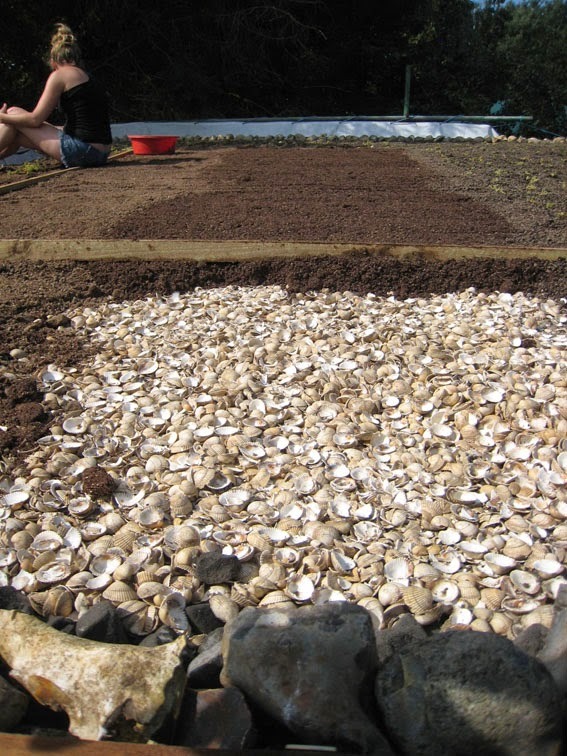 On my last blog, I showed pictures of bulk bags of cockle shells and 3 - 8mm leca, and of the shells spread on the roofing membranes as a drainage layer. 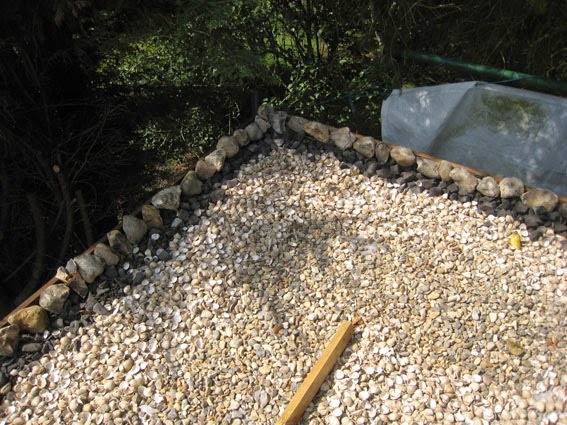 After completing the shell layer, I put a single line of flint cobbles around the roof deck. They are sitting on a layer of RFG to raise them up to be visible over the retaining boards. 3 - 8mm leca. These are fired clay particles used as a lightweight aggregate or insulation. They look like cocopops. Coir fibre. Sadly, I took no photos of the coir fibre before mixing. It arrives in 5 Kg blocks the size of a large shoebox. 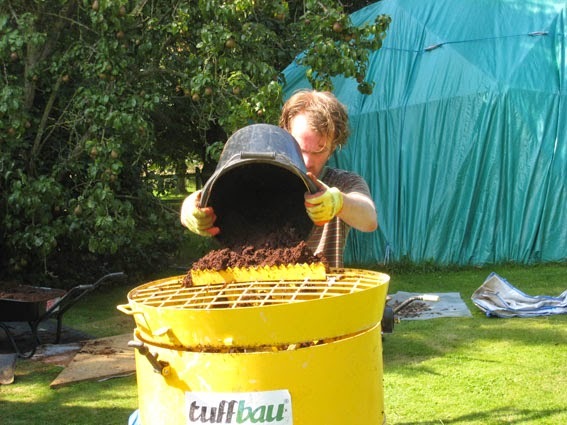 You add water to reconstitute it, and after you have added a lot of water and forked it over, you get a heaped wheelbarrow full of fibre from one block. Expanded Perlite. 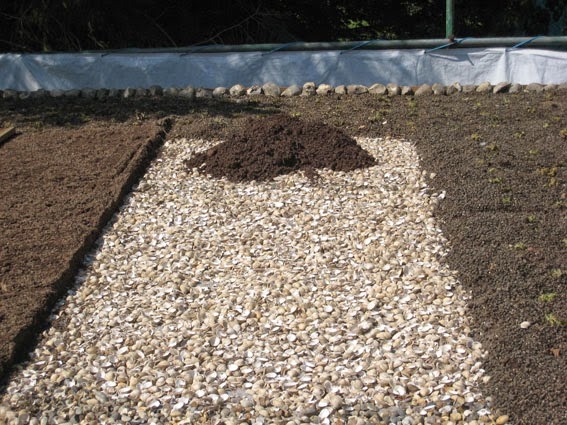 Perlite is a volcanic glass with a high water content. When heated, the water evaporates and leaves a lightweight honeycomb glass structure. I used a 3mm grade. Crushed rubble. I put a mix of everything in here: all the remaining RFG, some mortar from the demolition of a garden wall (source of my stem wall bricks), crushed brick. It all had to be crushed with a tamping rod. The mix evolved as I went along, mainly to make full use of the materials I had bought. 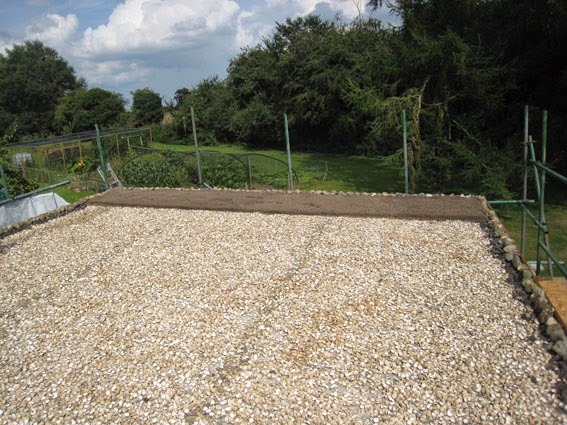 It started out as: 3 leca, 3 coir, 1 sand and 1 perlite (= 4 buckets); by the end, the final mix was 2 leca, 4 coir, 1 sand, 1 rubble and 1 perlite (4.5 buckets). 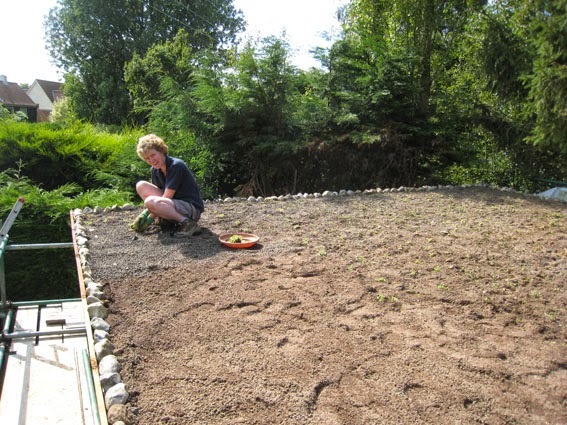 The whole roof took around 55 mixes, roughly 1 mix for each square metre of roof. 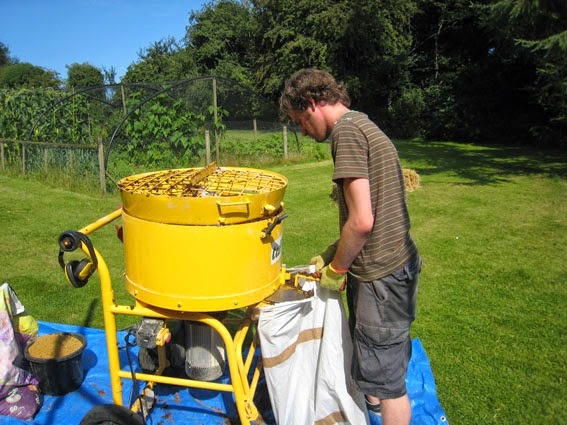 Loading the forced action mixer with coir. 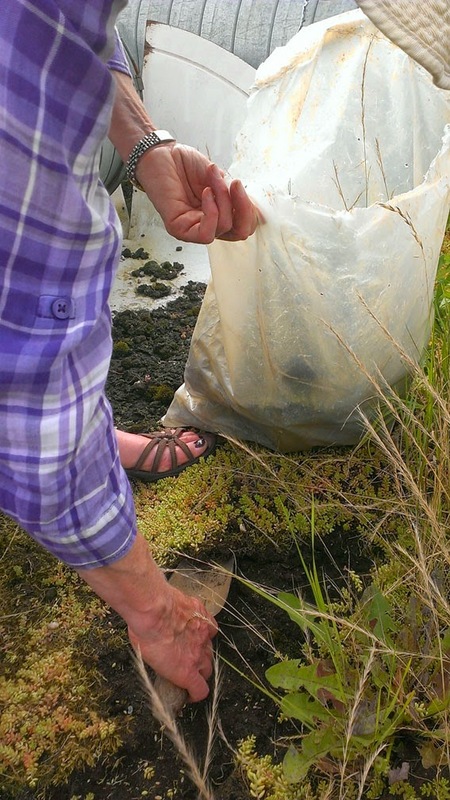 Two or three minutes later, filling sacks with well-mixed substrate. No, I haven't got a hoist! 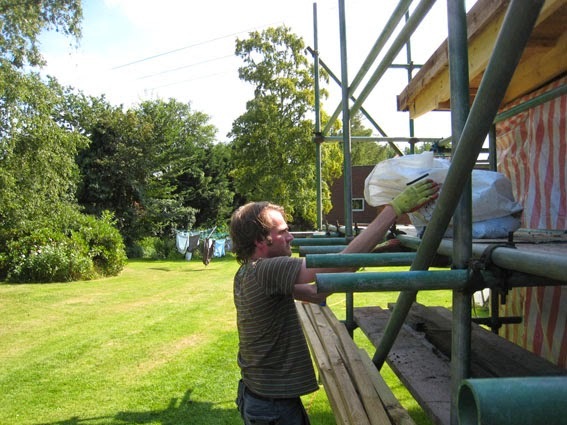 Using roofing battens on edge to regulate the depth - approximately. Last strip of substrate. Actually, you can see I have already planted some of the roof here, but I'm going to go back a step to talk about the plants. 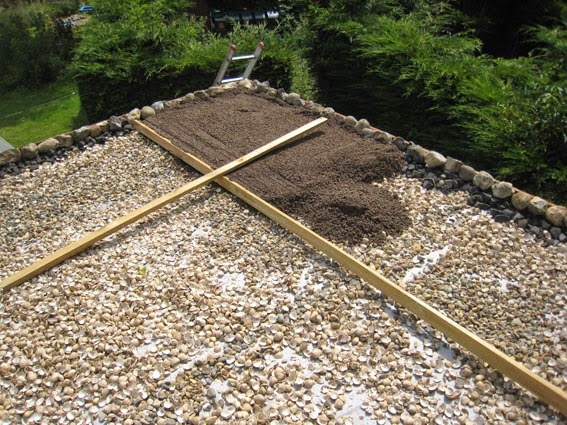 Plants: We want some drought-resistant, ground-covering plants for the roof, to hold the substrate in place and green the upper surface. 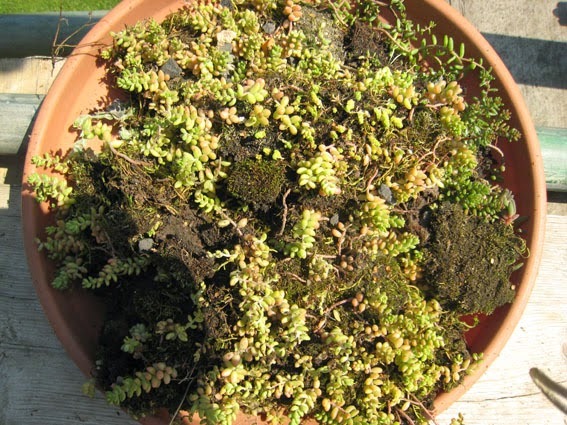 Sedum is recommended. 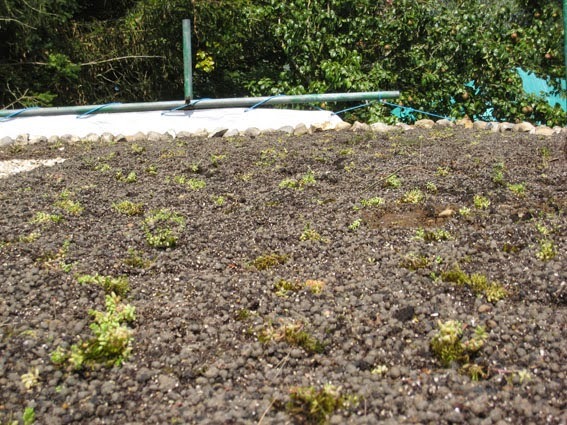 You can buy beautiful ready-grown sedum mats and unroll them on your roof, but with 55 square metres of roof to cover this would cost thousands of pounds, so we have another plan. We asked our friends what they had. In some cases, we were even cheekier and asked people we didn't know if they could spare some plants! 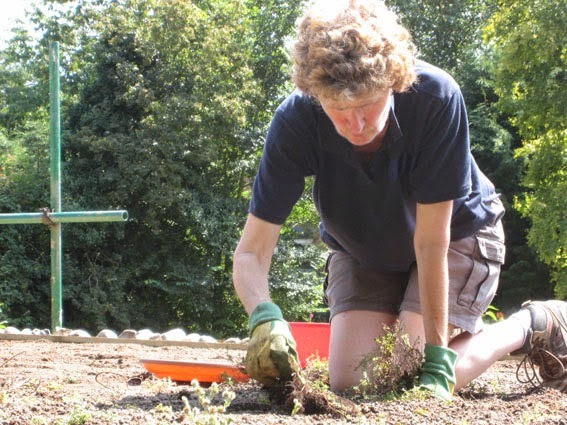 We were very kindly given a large tray of creeping thyme, a small tray of semper viviens, and as much wild sedum as we could dig up. 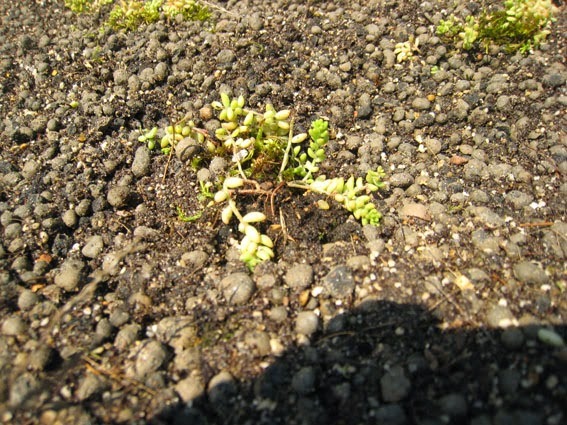 This is our source of sedum. 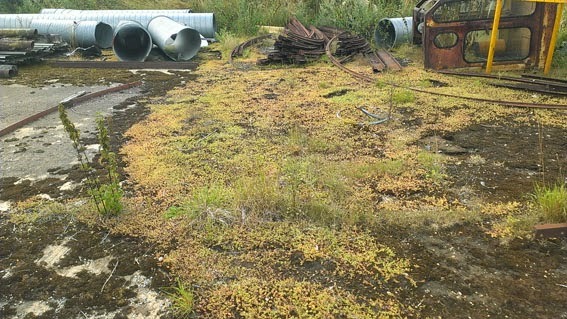 It's a concrete road circa 1941 on an old USAF Norfolk airbase, currently used for storage of potentially recyclable materials. We bagged up a small proportion of this. 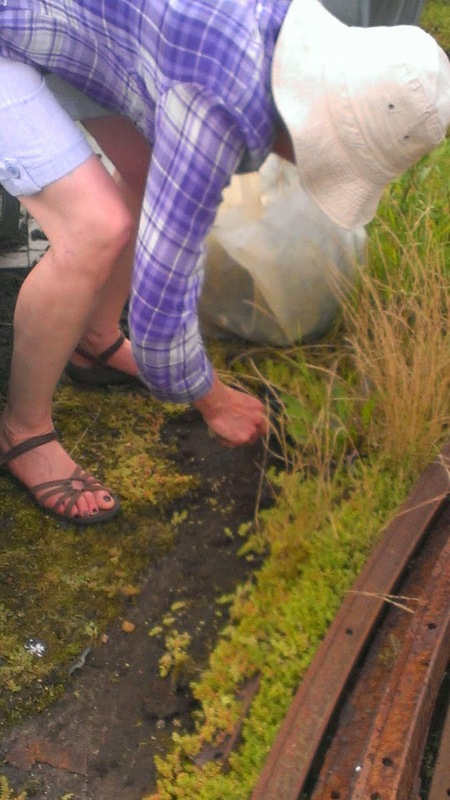 Then we divided the clumps, and planted plugs of plants at 9 inch separation over the whole roof area.